Just a quick post to update where I’m at! The sweater I’m knitting is almost done. I’ve finished editing Hearts and Hazelnuts, and have gone through the first round of edits on Ghost of a Chance. I’ve finished writing Lost Souls Found, and have submitted it. I’m working on Somebody to Die For….but I had a lag there for a while during which I had to work through a wee bit of burn out. Also, during edits for Ghost of a Chance, I had to decide on some changes that effect the series as a whole. Even though these books stand alone, I want anyone who reads any or all of the books to have a consistency throughout. So that slowed me down some as well. Also! A Timely Gift, my solstice + Christmas story, has been contracted to be part of DSP’s Advent Calendar, so pretty soon there will be edits with that as well. So I’m working hard, and now that I’m back on track with StDF, I intend to put a good dent in the word count and get it done in the next couple of weeks. And that’s it for me! Hope everyone is getting through summer (or winter) okay! I’m on sale today! 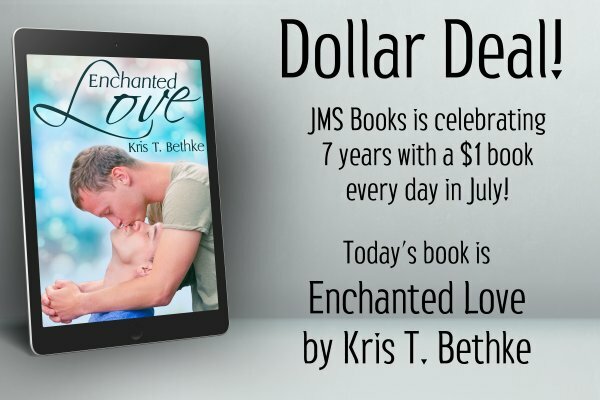 Head over to JMS Books and you can get Enchanted Love for just a dollar. Today only! One in Vermilion is out now! It’s funny how this story came about. You see, I saw the sub call (and man am I a sucker for sub calls) so I got to thinking. And the more I thought, the more the story coalesced. Two guys, who both need a new start, find each other at the right time and just connect. The dogs help. But it’s really just a right time, right place kind of thing. And more than that, they both need to heal. Wyatt needs to take a chance, Tru needs to face his past. And together, they find a love that’s one in a million. I love these guys. I love the dogs. And I especially love the punny title, which I thought of first when thinking about colors, and just knew there had to be a story to go with it. And next week, we’ll visit Wyatt and Tru again for Flash Fic Friday. Wyatt Janson needed a change of scenery in the worst way, so he packed up his dog and moved to a small tourist town. 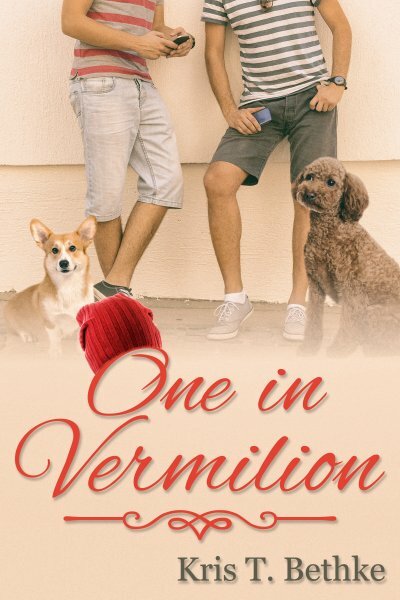 When he spots a man in a vermilion beanie, he’s intrigued. Why would someone would wear such a hat in the middle of summer? Their paths keep crossing, and Wyatt soon learns that Truitt Rackley owns a dog grooming and training service. It’s the perfect opportunity for Wyatt to meet Tru. What begins as friendship quickly blossoms into more. But Tru’s happy demeanor hides a sad past. The hat he wears is only one part of it. Tru needs Wyatt’s support as he deals with the fallout, and Wyatt is glad to be able to provide it. Now that he’s found Tru, he knows he’ll do whatever he must to keep him. Can two broken men find the happily ever after they’ve been searching for? Releasing tomorrow from JMS Books! Cole took one look at his desk, dropped his bag to the floor, and cursed. Well, silently cursed, as he was in the office and the sorts of words he wanted to say would definitely get him in trouble. For the third day in a row, his pen holder was on the wrong side of his desk. The mouse pad was turned the wrong way. The phone was moved, the chair was lowered, his monitor was off center, and his stapler and tape dispenser were set askew. He grumbled, trying to keep it quiet. Three days these childish pranks had been been going on. Now he had to spend time–time he should be working–straightening his desk just so he could work. He knew if he made a big deal about it, then the jerk or jerks would had done this would feel as if they succeeded. Cole didn’t want to give them the satisfaction of knowing they got to him,. But frankly, it was more than a little irritating. Once his desk was set to rights, he logged in and began working. It was only an hour, when the columns of numbers were starting to swim before his eyes, that he realized he hadn’t gotten his usual coffee from the break room. Too distracted by finding his desk messed with, he’d forgotten to make a cup. That rankled even more. Whoever had done this was messing with his entire day now. Aggravated, he grabbed his favorite mug and went to get his much needed caffeine. Cole jerked his head around to see Mason loitering by the coffee pot. Cole tried not to scowl. Mason always seemed to be well put together. More than that, he had a relaxed and jovial attitude that Cole found irksome. Everyone in the office adored Mason. Cole couldn’t say that he disliked the man, but he didn’t find him as charming as everyone else seemed to. “Yes. I’m fine,” Cole snapped. “I’m sure.” Cole would not admit that he was beyond irritated. Instead, he poured himself a mug of coffee and all but stomped from the break room. With sufficient caffeine flowing in his system, Cole was able to focus. Before too long, he was so absorbed in his work he’d all but forgotten about his the state of his desk when he’d arrived. At twelve-thirty precisely, he clocked out for lunch and headed down to the cafeteria to eat his turkey sandwich on whole wheat. Then he headed back upstairs. To find a purplish colored smoothie sitting on his desk, conscientiously placed on a napkin so the condensation from the plastic glass didn’t mar his desk top. Cole glanced around, but no one was paying him any attention. he sat at his desk, and noticed the note propped up against the side of his cup. It’s blueberry-strawberry-banana. Supposed to be good for energy. Odd, but Cole took a cautious sip anyway. It was delicious. And Cole had to admit, a few hours later, he didn’t hit the late afternoon slump he usually did. Six o’clock rolled around faster than normal. Cole was surprised when he heard his coworkers calling out their goodbyes. He started shutting down his computer and packing up, already dreading what state his desk would be in when he arrived in the morning. Perhaps he should put everything away in the drawers and lock them? Cole spun around to see Mason standing in his cubicle entrance, a look of sincere remorse on his pretty face. Cole shook his head, then narrowed his eyes. “That seems…rather childish, yes?” The words were out of Cole’s mouth and he racked his brain for a way to diminish the accusation, but Mason was already nodding. Cole had always found Mason attractive, but Cole never thought Mason would be interested in a somewhat staid introvert like himself. Clearly, he’d been wrong. And what was the harm in a drink? If it didn’t work out, they could part ways. Mason’s wide grin was all the answer Cole needed. Okay, so I got laid off. And it was kind of traumatic. And after I moped about that for a while, I decided to take as the gift it was and write. Write my little fingers off. I have deadlines. I could get done well before the deadlines. I could make progress! It will be good. And then I ran into trouble. At the same time I was looking at the word count in the WIP I was working on, and knowing damn well I didn’t have enough story left to make the minimum, I got edits back on Hearts and Hazelnuts. And in those edits, my editor asked me to look at two specific things and resolve them better. And I was like, wha? Why? So I turned to my Brubby. So we discussed the WIP first, and he suggested that I needed to add more of the secondary story line. From what I told him, that was basically the only way I was going to beef up the word count. He talked through some suggestions with me, some ideas that would add to that story line but still be relevant to the greater narrative. But nothing he said really gelled in my head. It didn’t really work. But I knew what he was getting at. I just had to think on it. So we turned to the second issue, the edits and the resolution that I needed to revise. I whined a little at first, but he wisely and patiently pointed out the reasoning in language I would get. And that made me laugh. There, when he suggested things, I was like “Oh oh oh! What about THIS? !” And he said yes, that works, and here’s how you do it. He talked out my resolution with me, and I knew clearly what I was going to do. On my way back to my computer later that evening, the thought struck and stuck, and I knew with absolutely clarity what to add to the WIP that would increased the length and also be a vital part of the story. So I threw it at him real quick, just so he could tell me it was the right idea (even though I already knew it was). And then I wrote. I wrote lots of words. And in two days, I finished Lost Souls Found, the sequel to my contracted Dreamspun Beyond title. It stands alone, in that the story is not dependent on the first to make sense. It’s a brand new couple, though we see them in the first. And it’s done, all but the final finessing and tweaking to make it as shiny as possible before I send it in. And now I need to start on the third book. Which has one MC we’ve seen before and one who is brand new.